With its Elvis impersonators, high-kicking showgirls, and crystal chandeliers, what fresh takes does Las Vegas’ Strip offer millennials? When I was last there 10 years ago, I don’t recall beer pong, craft cocktails, mod design, pool games, or cool viewing experiences beyond the Bellagio fountains. With the Linq Hotel and its High Roller wheel, that’s all changed. At the end of a recent girls’ weekend, the year-old Linq hit like a clean glass of water after a night of too much wine. So many Vegas hotels choke guests with opulence and excess. The cinder-blocky former Imperial Palace—its exterior now all aqua, yellow, and lime—is just plain fun. 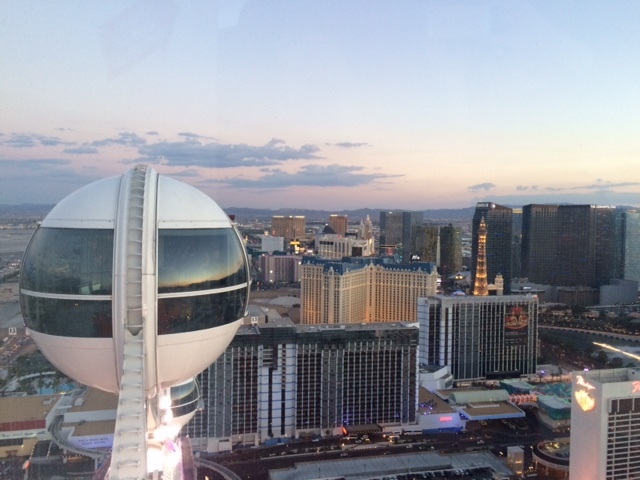 Truthfully, I’d come for the High Roller, the Ferris—whoops, I mean “observation” wheel behind the hotel. Its capsules glide riders 550 feet in the air. That’s more than 100 feet higher than the London Eye it’s styled like, giving the High Roller claim to world’s largest riding wheel. My friends were skeptical that the 30-minute ride, never cheap, would be worth it. It’s $25 during the day but jumps to $35 from 7 p.m. to 2 a.m. We were hopping (literally, as the wheel never stops turning) on at 7:30 p.m., just after the evening price hike. But that timing turned out to be perfect. We just missed the sun dipping behind the Spring Mountains. But we watched the sky turn honey, peach, and violet over the mountain-ringed Las Vegas Valley as the city’s lights started to glitter. We even saw the Bellagio’s classic fountain show from above. 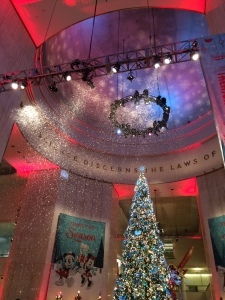 “I’ll admit it—I wasn’t sure, but this is really cool,” my friend Jo said, snapping endless photos. If you’re in Vegas, we say don’t miss the Roller, and make it around sunset. 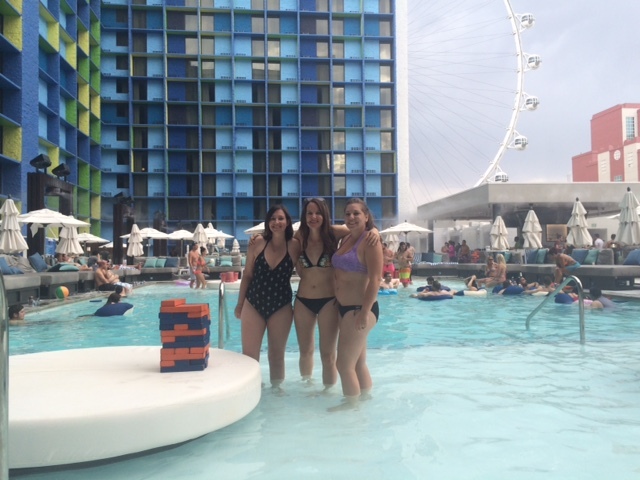 My friends were staying overnight at the Linq, so we also got to check out the pool and promenade. 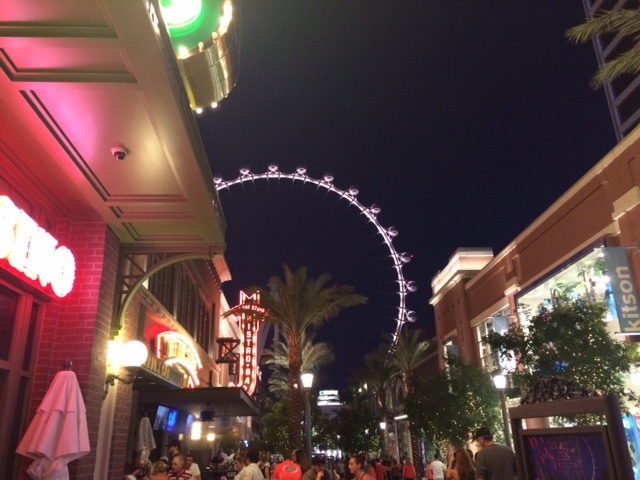 The promenade is a 300-yard brick stroll-way to the High Roller. Studded with palms and lined with appealing shops (fedoras and chocolate, Havianas and Polaroid), the promenade reminded me of Santa Monica’s ultra-groomed, outdoor-mall feel. We downed Neapolitan pizza and craft beer at Flour & Barley, taking in the colorfully lit fountains alongside us on the plaza. My favorite part, though, was the pool. After over-the-top pool parties elsewhere the day before, I loved its low-key scene, all floating bean bags and giant Jenga, danceable music but down-to-earth people. I later learned you can luxe it up (hello, $800 bottle service), but like its High Roller, the Linq for us was refreshingly chill. To visit some museums, you feel like you’ve got to take a timeout from the host city. And in an exciting place, or on a budding spring day, that can be hard to make yourself do. 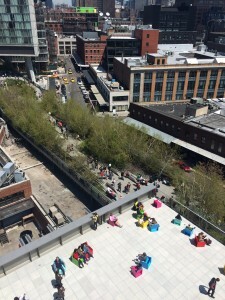 At the new Whitney Museum of American Art, no timeout is necessary. Seeing it will push you into the mix in one of New York City’s trendiest areas. 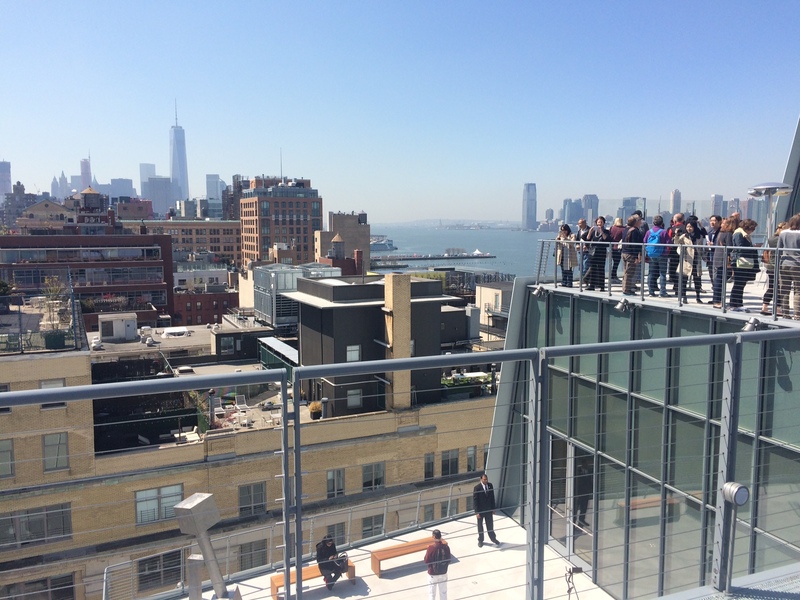 Plus you’ll get better views than the Empire State and a big hit of sunshine even while you’re surveying modern art. Here’s the story. This past weekend, the Whitney officially moved to a splashy new Renzo Piano-designed building in lower Manhattan’s Meatpacking District. You’ll still see wholesalers’ signs along the crumbling brick streets there, but stylish restaurants and boutiques populate the rest. 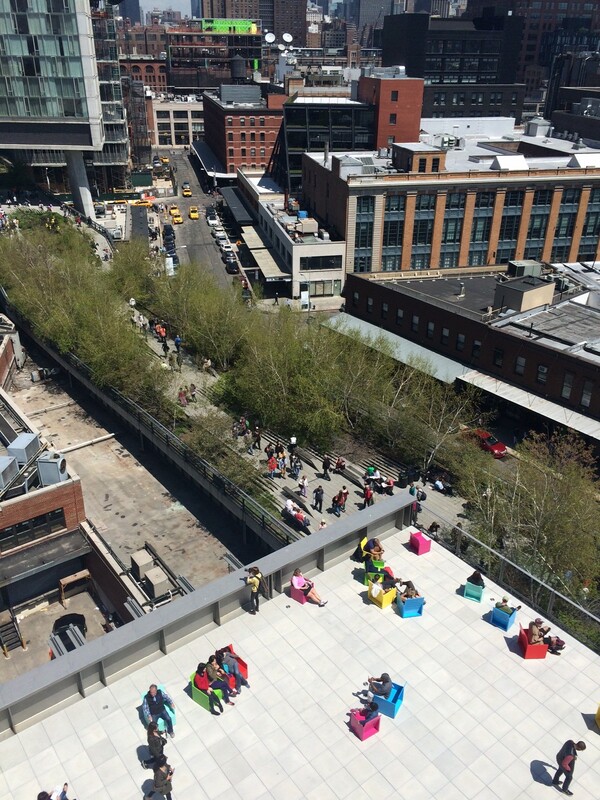 Most appealingly of all, the High Line—an elevated park created six years ago along former train tracks—now leads down to the Whitney. And the architecture sets off exciting art. The new Whitney’s inaugural show, “America Is Hard to See,” features works by big names like Georgia O’Keeffe, Andy Warhol, Jackson Pollock, and Jasper Johns. 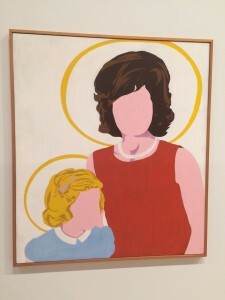 Great pieces by underrated 20th-century American artists have been studded into the exhibition as well. One favorite: “The Seasons,” a huge canvas blooming in semi-abstract green and pink by Pollock’s wife, Lee Krasner. Look for more in September’s Arts and Culture issue of Buffalo Magazine. My friend Tom never has to get detailed about where in Toronto he lives. 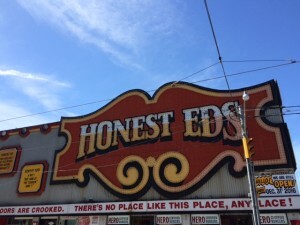 When he says it’s near Honest Ed’s, every soul in this metro of six million understands where he means. 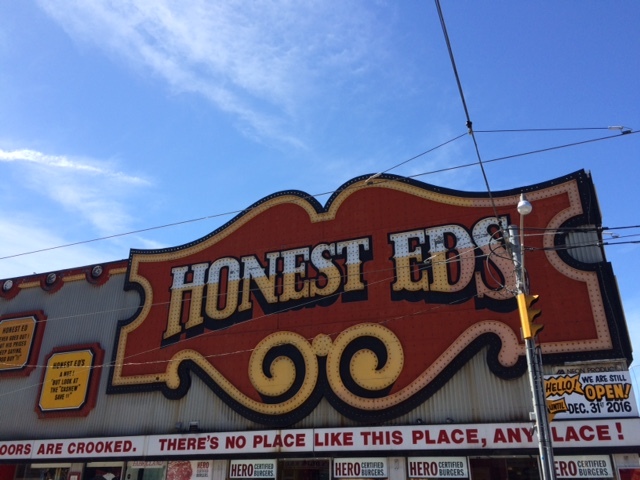 In fact, everybody in Canada seems to know Honest Ed’s, a discount emporium that is one of Toronto’s “few beloved institutions,” as the Globe and Mail puts it. Being around since 1948 has helped, but a combination of rock-bottom prices and over-the-top signage made the store famous. Vintage celebrity black-and-whites line the walls, a relic of late founder Ed Mirvish’s theater patronage. Until his death in 2007, Mirvish hosted every performer who came to Toronto, from Jessica Tandy to Tony Bennett to Lauren Bacall. Adding to the crazy decor are retro handpainted signs by the hundreds. Honest Ed’s employs two full-time sign writers, who still do every sign in red and blue watercolors. The effect can be overwhelming. “How do I get out of here?” a lost shopper asked me as we surveyed the endless variety of closeout goods. 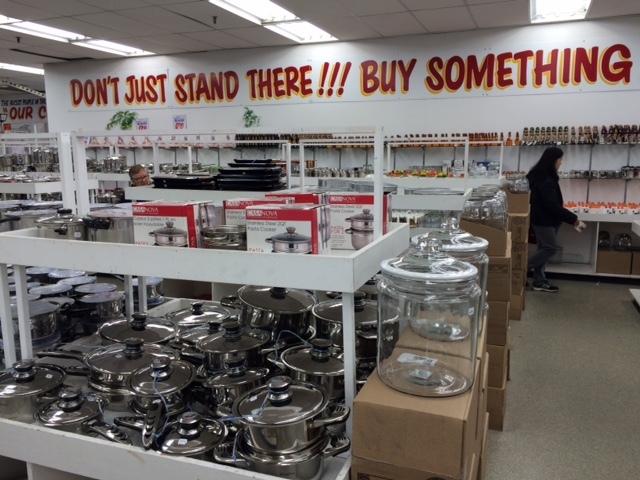 It’s worth a trip to the Annex neighborhood to shop this relic from the past. But you’ve only got a year and a half. On Dec. 31, 2016, Honest Ed’s will give way to a glassy 1,000-apartment tower and close its discounting doors forever. Still, Torontonians aren’t letting go easily. When the store held a sign sale this month, customers started lining up at 4:30 a.m., and ultimately bought 6,000 signs. Set in a former Columbus car mechanic’s shop, Brothers Drake has all the vats and tanks that a microbrewery would. But there’s something different here: The floor is sticky, and the air smells sweet. 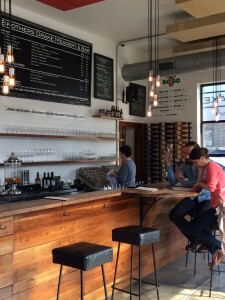 This is actually one of the Midwest’s best meaderies. Brothers Drake crafts mead, or honey wine, said to be the world’s oldest alcoholic drink. Wearing a scruffy beard and a man-bun, DeVilbiss looks like the homebrewer he once was. 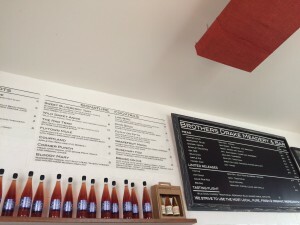 With an earnest geekiness, he broke down the science for us of making this specialty wine. At its most basic level, mead takes fermenting honey, water, and yeast. But temperatures, pH balances, and carbonic acid are assessed along the way, he explained. 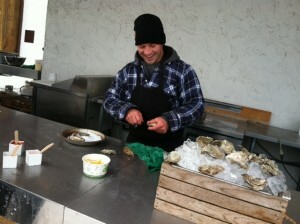 Then he cracked open 55-gallon barrels of wildflower honey for dipping. I was all for sampling the honey, but skeptical about the final product. I’d tried mead before and found the taste much like beer, yet with a syrupy sweetness and funky-sour aftertaste. But at Brothers Drake, I got a surprise. Its most popular Wild Ohio and Hopped Ohio versions tasted more like dry, unoaked chardonnay. Other batches ranged from a spicy Blueberry Chai to a sweeter Apple Pie to a tart Sour Paw Paw named for the native Ohio fruit. As craft brews and artisan spirits resurge, mead is the latest beverage to get its own fresh taste. The number of U.S. meadmakers has gone from roughly 75 to 250 in the past few years, according to the American Meadmakers Association. California has the most producers, followed by Michigan. Naturally, three of the country’s most hipster cities— Austin, Portland, and Boulder—host meadmakers, too. There’s sharp debate, it turns out, over the process, and whether to make it more in the model of wine or beer. Part of the secret at Brothers Drake, DeVilbiss said, is aging the meads like wine. Of course, I shouldn’t tunnel into the various methods too deeply yet—clearly, more sampling is needed. But preliminarily, if aging is part of what it takes for people like me to learn to enjoy mead, I’ll say cheers to that! The bar at Bida Manda. Our good friends Jeremy and Cassie live there, and they started sending us articles to prep. These stories tended to be headlined “Why You Must Eat Pizza in Raleigh” and “Raleigh’s Food & Drink Scene Looking Up in 2015.” I sensed a theme. So we noshed through the city, whose cuisine surprised us at every turn. And then we saw the nuttiest food-centered workout imaginable. The first standout thing: Even in the often macho, male-dominated restaurant industry, Raleigh’s top chef is a woman. Ashley Christensen won the James Beard Award for Best Chef in the Southeast last year. 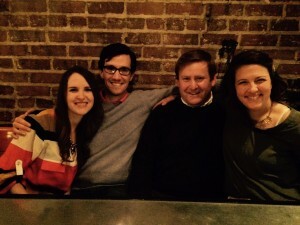 She has five restaurants and bars in Raleigh, with a sixth on the way. And despite its morning-smell of perking coffee, Joule becomes a sophisticated evening spot, with Carolina entrees like catfish, trout, and espresso-rubbed short ribs. A perfectly angled mirror strip let us watch the action behind the blue-walled coffee bar at all times. Credit ed via Flickr Creative Commons. 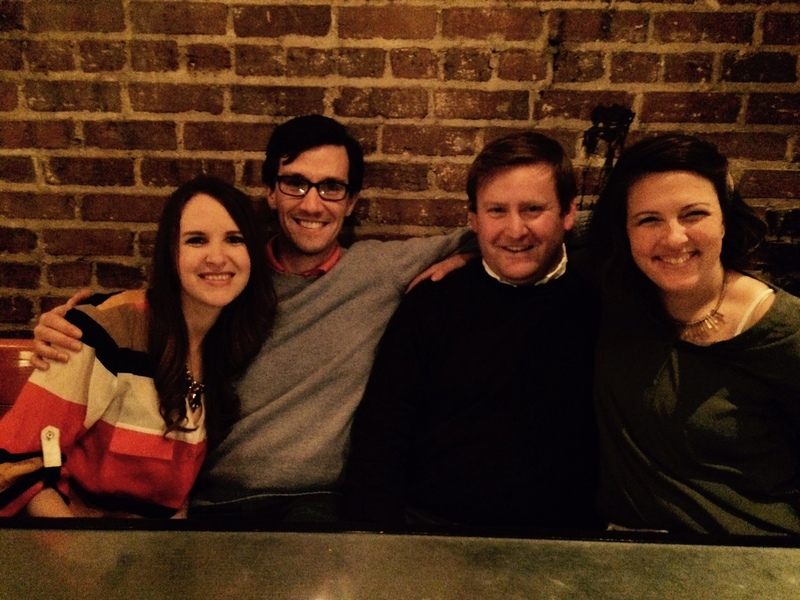 Raleigh’s second surprise was its fusion cuisine. Our early favorite was Bida Manda, which infuses (way underrated) Laotian cooking with North Carolina influences. 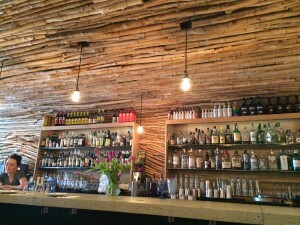 The restaurant’s approach was encapsulated in its shiny-yet-rustic bar. 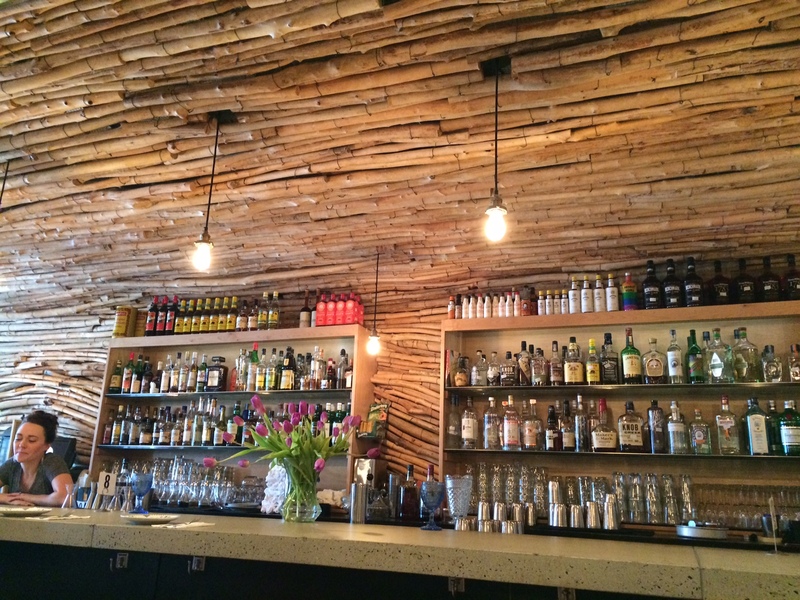 The wood looked like imported Laotian bamboo rods, our server explained, but it was actually from local North Carolina trees. Another fave was Jose and Sons, where Southern meets Mexican in dishes like collard- green-wrapped tamales. Jose himself was eating those tamales at the huge round bar, and we chatted with him. “My sons did this,” he said in his Spanish accent, glancing around the space proudly. Krispy Kreme Challenge. Credit Suzie Tremmel via Flickr Creative Commons. Then there was that food-themed exercise. On Valentine’s Day, we got up early to watch the Krispy Kreme Challenge, celebrating the classic doughnut chain founded in North Carolina. 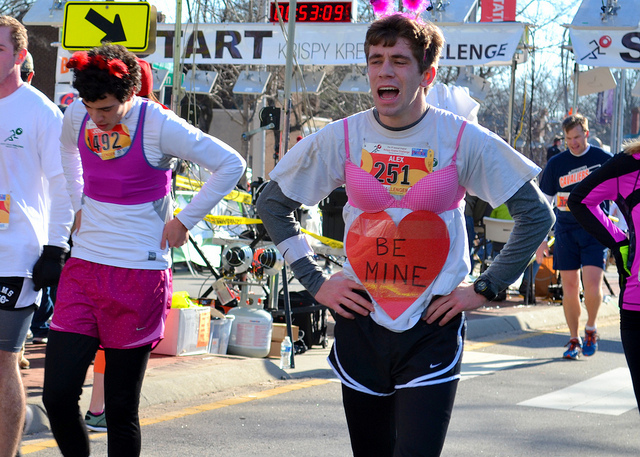 This, folks, is a five-mile race that involves a dozen doughnuts—running 2.5 miles, downing 12 glazed rounds, and staggering another 2.5 miles back. What?! Although top competitors had to be seen eating all the doughnuts, not everybody was in it to win it—many just ran back with full boxes in hand. What we loved, though, were the people dressed up, as heart-shaped candy or with doughnut inner tubes around their waists. Clearly, Raleigh is a town that takes eating to the max! Look for more in San Antonio Magazine in a few months. The world’s coldest, darkest harvest is time to celebrate how hardy our winter selves can be. 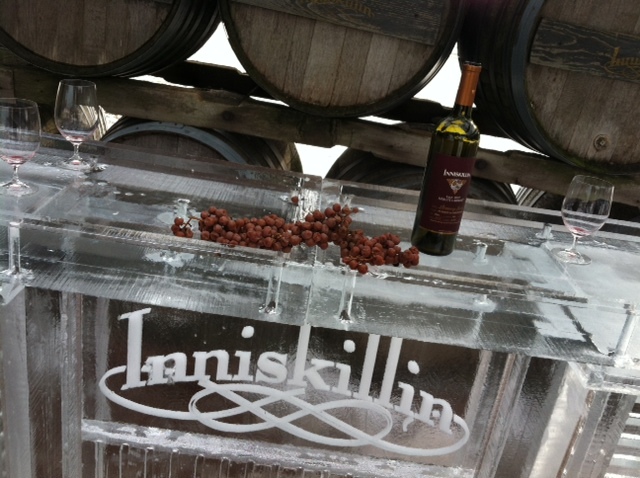 Last weekend, we grabbed the chance to do that with friends at the Niagara Icewine Festival. 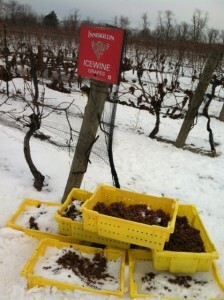 What is icewine? 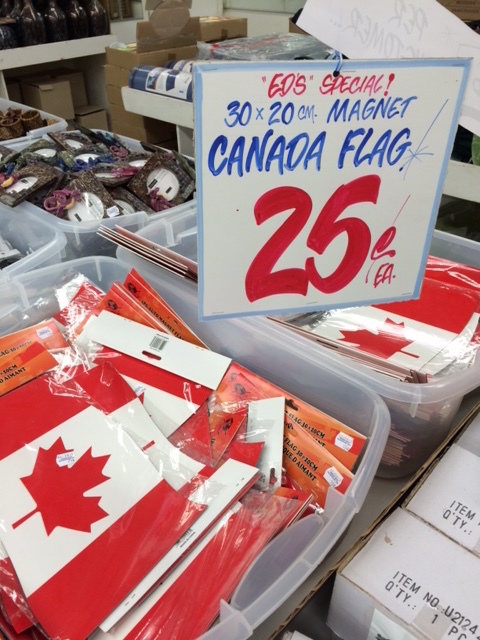 Until I moved 10 minutes from the Canadian border, I didn’t know either. Now I’ve tried this chilly wine-nectar. I’d call it the north’s (unfortified) answer to port. 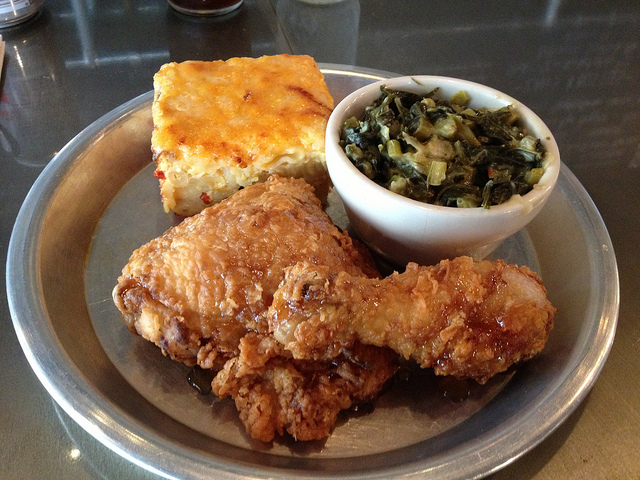 It can be served with dessert, but cheese or other savories cut the sweetness. What’s really unique about icewine is how it’s made. Only at this time of year, when temperatures stay below 18 degrees, can the grapes can be harvested. Workers will go out around 2 a.m. to hand-pick frozen, shriveled grapes with stiff fingers. They’re trying both to avoid frostbite and to overcome exhaustion. And they never get milder picking nights—if it’s not cold enough, there’s no harvest. 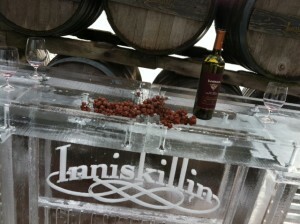 At Inniskillin, our favorite winery of last weekend’s festival, my friend Alison and I tried the icewine grapes. The winemakers had left full yellow milk crates of fruit by the vines. They tasted like slushy raisins. The contrast between the tough harvest and the decadent product struck me. There we were, sipping icewine with Prince Edward Island oysters and creamy poutine outside a Prairie School-style restored barn. 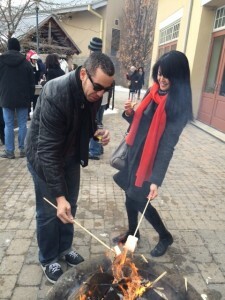 At the next vineyard, Peller, we’d roast fist-sized homemade marshmallows over a fire with lots of other rosy-cheeked icewine fans. Woodsmoke hung in the cold air both places. Sure, we were all braving the day outside, but it was plenty easier than harvesting the grapes on a bitter night. Still, it’s only been five months since we moved north. Maybe next year I’ll volunteer for a night of frigid grape-picking. For now, standing outside in Canada in January drinking icewine that someone else harvested feels hardy enough. Growing up 100 miles south of Chicago, we often visited its famous museums. For my 8th grade field trip, I remember group-trekking through the Museum of Science & Industry. The exhibits were interesting, if not gripping. But boy, things have changed! 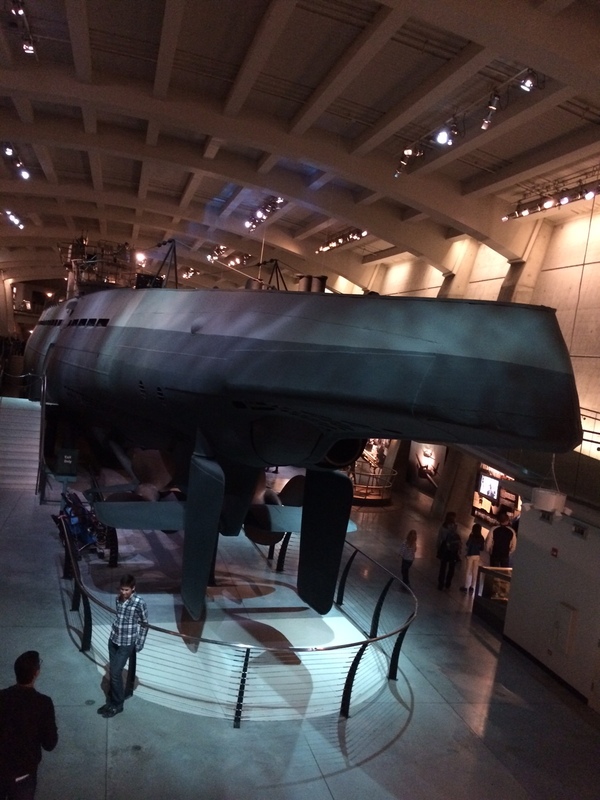 A recent visit to Science & Industry’s rare captured German U-boat from World War II demonstrated that. The museum has displayed the U-505 since 1954. But in the last decade, it was moved indoors, into a 35,000-square-foot exhibit that’s downright suspenseful. The stakes were set with explanations that U-boats had only been sunk, never captured, before the U.S. military’s Task Group 22.3 decided to try it. Rare archive video footage flashed on a big screen, putting us there in the Atlantic in 1944. A capture would require the Americans to board the bombed U-boat after most of its crew had abandoned ship, we learned. But other Germans could be waiting for them inside—as could explosive traps. And the damaged sub could sink at any moment. Just when I was wondering, “What happened in there?”—boom! There were six or eight phones we could pick up to hear recorded oral histories from each man who boarded. What’s better than hearing a story directly? The rest of the exhibit offered lots more on the capture (in which, miraculously, no American lives were lost)—but that’s when it grabbed me. Meanwhile, I have to admit I’d never heard of the Chicago Historical Society or its museum, now called the Chicago History Museum, until two weeks ago. That’s when I discovered it’s got to be the best city museum anywhere. For every member of the family, there was an appealing exhibit: Lincoln for dads. How Michigan Avenue became the Mag Mile for moms. 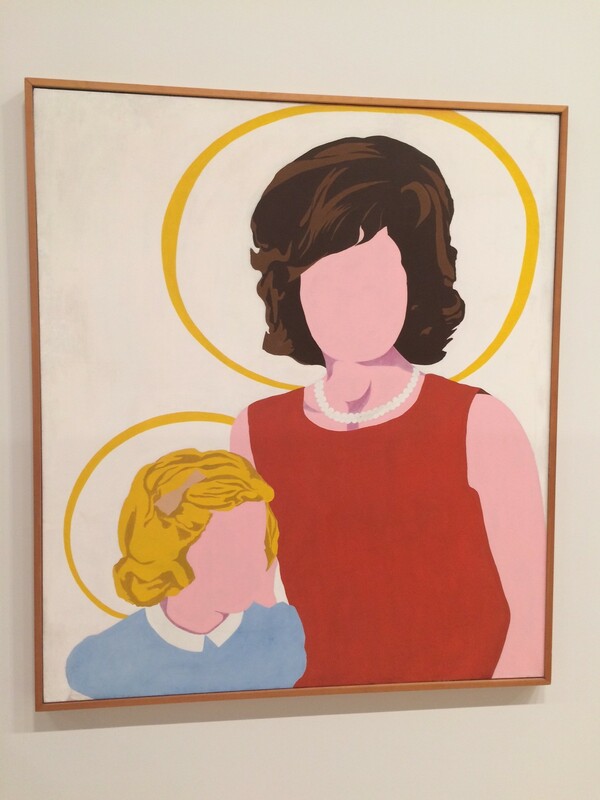 “The 1968 Exhibit” for rebellious young adults (and nostalgic parents). My husband and I were drawn to Vivian Maier’s Chicago, showing the images of the “nanny photographer.” She tended to suburban kids by day; only after she died in 2009 was her stunning catalog of street photos found. I appreciated the way this world-class city museum presented Maier’s work. Blown-up images hung in the room’s center. Strips of smaller photos were grouped on the perimeter for people like me who wanted to dig in more. And the gallery wasn’t silent—jazzy piano tinkled over cars and horns and other street sounds. Museums are all seeking to hit more of the senses, and they’ve been especially good at adding sound. 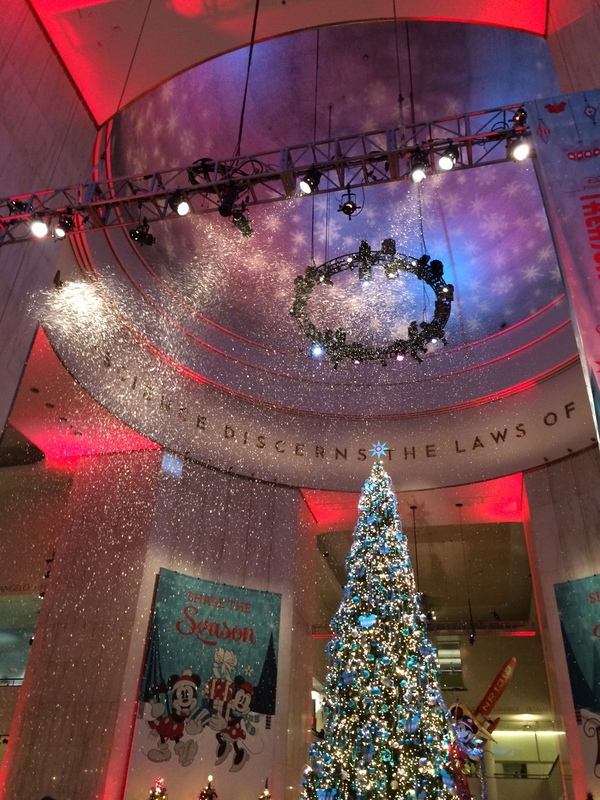 But props to the Chicago History Museum for hitting scent, too! The centerpiece “Chicago Crossroads” exhibit included a lid you could lift to smell wild leeks. Did you know the leeks are what Chicago was named for (although I’ve also seen it translated as “wild ramps” or “stinky onions”)? My cousin, who grew up there, hadn’t—proving that these updated museums offer lots for even natives to learn. My family and I were cruising away from Madison the other week, toward Toby’s Supper Club outside town, and a strip of pink neon told us we’d arrived somewhere special. 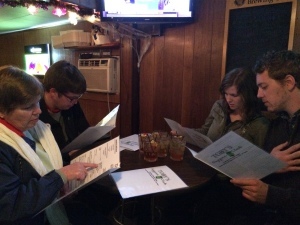 Walking in, we were surrounded by wood paneling. The scent of baked potatoes nearly bowled me over. It was like a combination of Grandma’s basement, a hunting cabin, and a church fish fry. Pure comfort. A full day of tailgating and football-watching had just wrapped up, and we were hungry. Good thing! 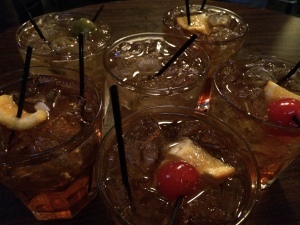 A round of whiskey and brandy old-fashioneds was on its way. We were starting to realize what was special to these places. I’d tried the old Google dictionary trick, “define: supper club.” But the answer that popped up, “a restaurant or nightclub serving suppers and usually providing entertainment,” was unsatisfying. Worse, the next few results advertised places in California. 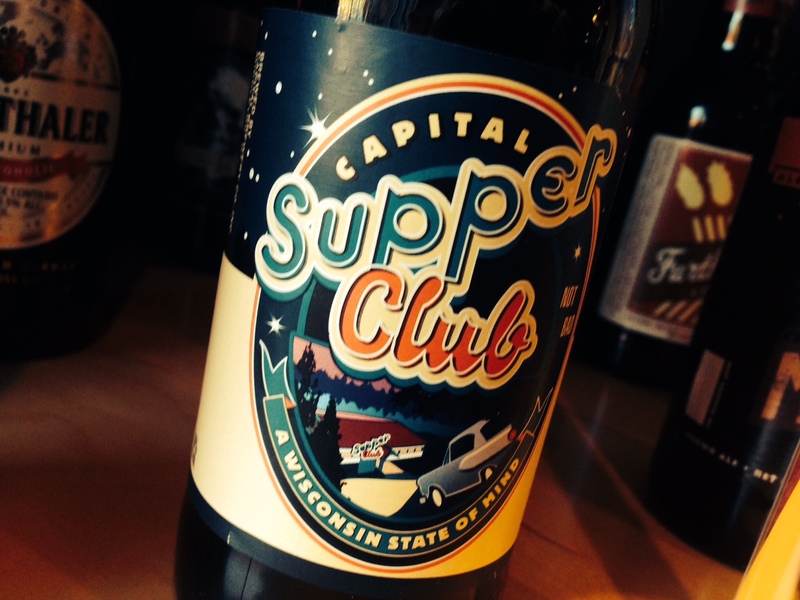 I’d been assured by our family’s dinner guest, native Wisconsinite Ethan Schwenker, that supper clubs were a Midwestern thing. “For ice fishing season, supper clubs are the place to go,” he said. A Midwest Living story confirmed the geography, saying that supper clubs are prevalent in Wisconsin but can also be found in Minnesota, Michigan, Iowa, and Illinois. Even as an Illinois native, I hadn’t known about them. My brother was still puzzled about what differentiated these “clubs” from restaurants. Aside from placing our order at the bar, then being seated only once the food was ready, Toby’s seemed to operate like most other paid dining establishments. No club membership was required. But just like the word “diner” tells you that pancakes, omelets, and bottomless coffee will be on order, “supper club” tells you what style of restaurant to expect. It’s the throwback style, the relish trays, the mandatory old-fashioneds, and the traditional prime-rib-and-fried-fish menus that make supper clubs unique, we realized. Dinners don’t get any more comforting, retro-fab, or Midwestern than that. As someone who studied in Des Moines, recently lived in South Bend—and loved both—I don’t mind my cities underrated. Which works out nicely, because we’re moving to Buffalo! Husband Matt landed a great job at a venerable bank, and off we go. Visitors take note: it’s only 15 minutes from Niagara Falls and an hour from Toronto. 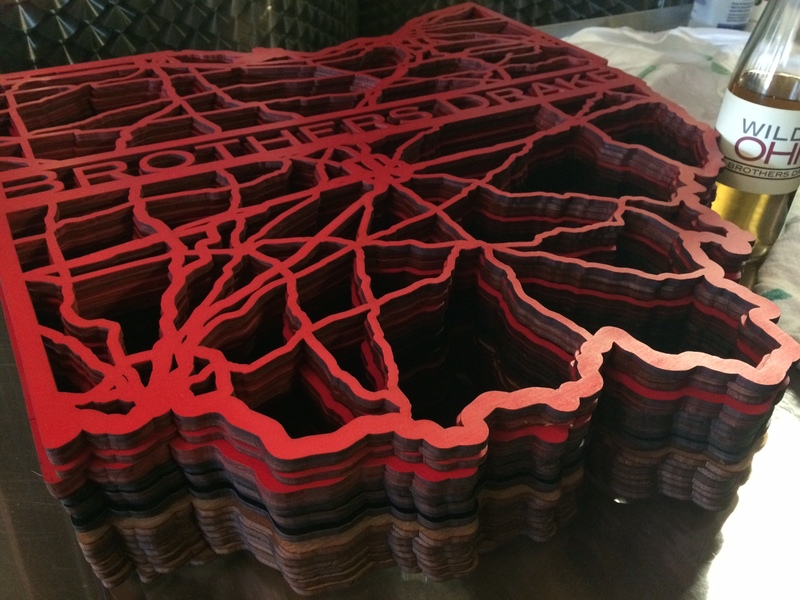 Slightly farther afield are the Finger Lakes winelands and the city of Montreal. Travel stories on all are definitely to come. 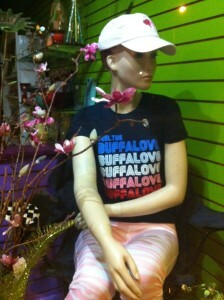 But Buffalo itself has loads to offer, as I’ve learned within two days in the city. 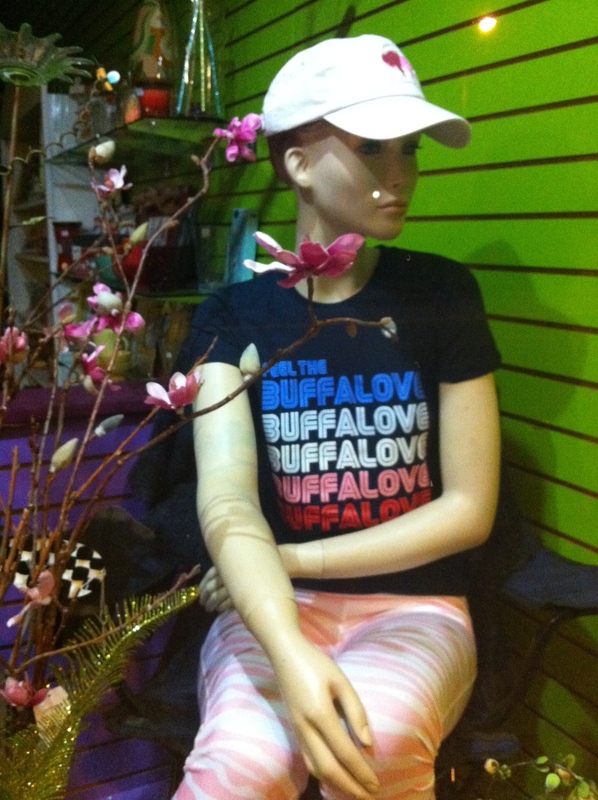 Here’s why we’re feeling the “Buffalove,” as my favorite disco-style T-shirt puts it. For starters, our neighborhood, Elmwood Village, has been ranked one of the top 10 in the country. It’s jammed with gracious Victorians, solid old mansions in stone and brick. The tree-lined parkways remind me most of the ones in St. Paul, Minn.
We’ll watch people stroll by from under the umbrella on our second-floor porch. The neighborhood’s best feature is its walkability. We’re two blocks from the 200 businesses of Elmwood Avenue, an urban strip so long and vibrant, it could be in New York City. The Belgian beers of the Blue Monk gastropub and the rustic-industrial furniture of the Ró homegoods shop are our favorites so far. Yesterday we dropped in on the Elmwood Avenue Festival of the Arts. Its five blocks of booths offered many outlines of buffalo, the city’s enduring animal symbol, on handcrafted products like greeting cards and jewelry. 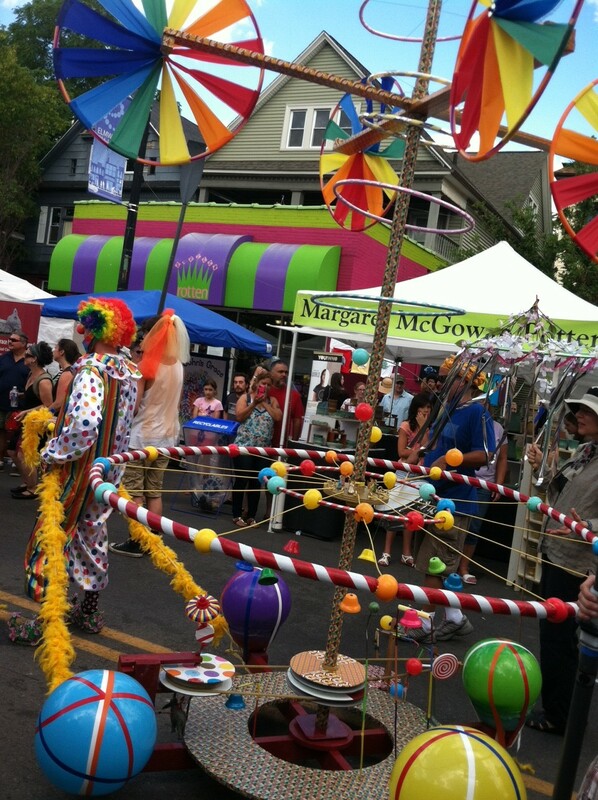 It was hard to decide what I liked better at the fest: a buttery parm-and-breadcrumb-stuffed artichoke or the kooky parade of stilt-walkers and crazy-costumed locals beating tambourines. Architecturally, there will be lots to dig into in this grand old industrial city. Buffalo features early Art Deco skyscrapers downtown, Frederick Law Olmsted-designed neighborhoods beyond, and one of Frank Lloyd Wright’s masterpieces. The weather felt like California’s on the late-spring day we first visited. And it struck me that if this city’s infrastructure were in SoCal, real estate would be as dear as in Pasadena. The climate just daunts people now that the Sun Belt has boomed. And Buffalo is the fourth-snowiest city in the United States, to be fair. But a diverse lot of people have been surviving here for centuries. French explorer Jacques Cartier first encountered Haudenosaunee (or Iroquois) tribes living along the St. Lawrence River in 1534, as I learned at the excellent Buffalo History Museum. The city’s first batch of settlers included German, Dutch, English, and African-American men, as well as a Seneca woman. Even now, long after the industrial golden age faded and two decades after Bethlehem Steel shut its doors, Buffalo’s 260,000 residents are impressively diverse. Coming out of South Bend, we know we can survive snowy winters along with them. I have a feeling we’ll enjoy life here. But there’s one thing that’s not likely to change, despite the city’s signature food: I hate chicken wings. Today it’s been tamed into a classic American pleasure park of beaches and little family joys, including mini-golf courses, ice cream parlors, and a drive-in theater. 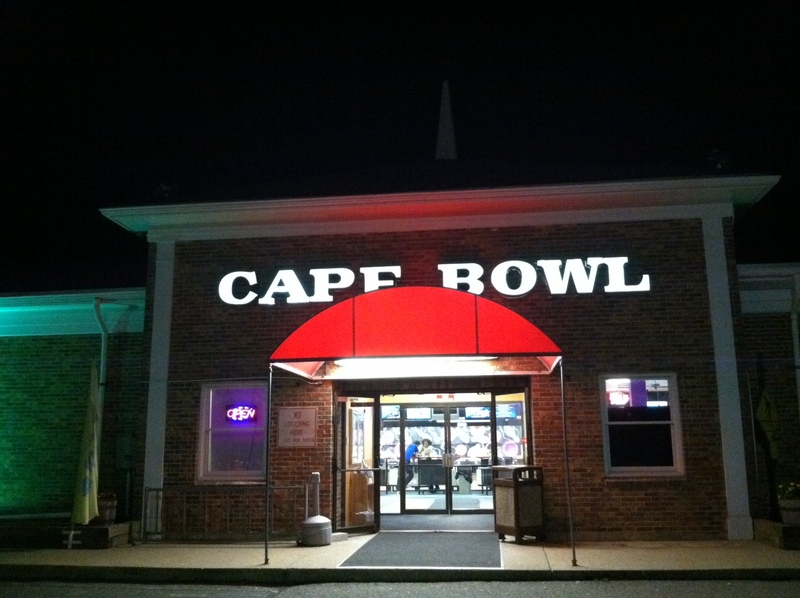 The modern Cape deserves a summer-vacay whirl, and when you take it, don’t forget to try candlepin bowling. A sub-100 standard bowler myself, I decided there was nothing to lose during our five days in the seaside town of Dennis this week. 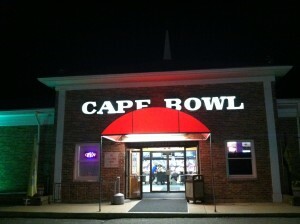 We cruised over to Cape Bowl, one of several bowling alleys here offering the candlepin variety. But “regional thing”—exactly! In an age of American homogenization, people shuttle between states and accents fade out. A regional thing was just what we wanted to try. First surprise: the balls were the size of grapefruits, and not much heavier. There were no finger holes—I was told to just hold and heave. For a woman especially, the light weight felt freeing. And gutters were regular-size, which meant sometimes I got the fun of a gutter ball skipping back up and taking out an end pin. Second surprise: I got three rolls per frame, and the knocked pins didn’t get cleared between rolls. The counter guy called these pins “dead wood” and promised they could be helpful. 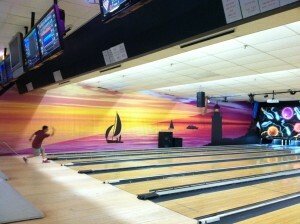 So why hasn’t candlepin bowling taken off beyond New England and Eastern Canada, virtually the only places it’s played? When I scored 56 on my first game, and only 78 by my third, I understood: it’s inconsistent. The not-so-tippy pins are six inches apart, and the results are wacky. Later I read that a perfect candlepin game has never been played; the highest score ever has been 245. Of course pros would prefer a game in which the pins tumble easily, and the big question is whether they’ll strike or spare. But for those of us who take our score less seriously, candlepin is fun.